I am absolutely struggling at the moment. Part of the trouble is ‘new studio syndrome’, which I commented on earlier when Willis was nagging me about it. I thought I’d got away with it but it has turned around and bitten me on the backside! When you start doing things like cleaning the toilet because you’re afraid of doing some work you KNOW you’ve been badly bitten… Well my studio is spotless and I’m driving myself nuts wibbling around and being ineffectual. Various other things (i.e. not directly related to cleaning or art) are also stressing me out: money, builders, the strange damp patch that’s appeared in the pantry ceiling, money, failure to be awarded a residency, general sense of uselessness, sudden departure of my new chicken, enormous quantities of weeds and lack of hours in the day to deal with them, yada, yada… I bore even myself when I get like this. The solution? Well a sudden influx of cash would be nice, but in the meantime I’m reading a wonderful book by Matthieu Ricard called Happiness: A Guide to developing Life’s most important Skill, which is attempting to persuade me that the sudden influx of cash idea is a) misleading because it won’t actually make me happy and b) that happiness is an inner condition, not a series of external factors and that I can learn to be happy without the cash. Hmm. I’ll have to persevere with the exercises, then. I’ve clearly got a long way to go. BUT WHAT ABOUT THE STUDIO? My other strategy is to START WORK, viz. 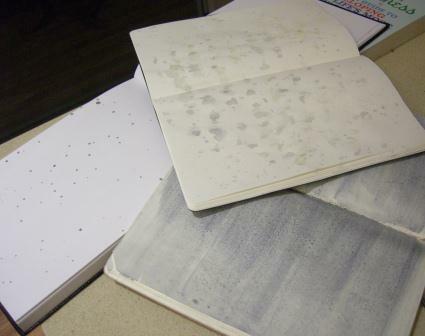 the photo, which is of a series of painted splotches, droplets and washes in a series of sketchbooks. One of my (many) anxieties concerns the pristine nature of blank sketchbook pages so I’m taking a leaf out of Sue Brown’s armoury of techniques and challenging the hegemony of the blank page! OK, Sue does it in style with emulsion paint, ink and bleach… my first tentative experiments in this area are tamely made with dilute acrylic paints but somehow it felt good and rather bold to splash around on the page without any clear idea of what I was doing. That was yesterday evening, when I managed to pull out the paint, deface three sketchbooks and clean off two copper plates. Today I’ve been slightly more productive: I’ve gessoed some hardboard ready for painting (god – I haven’t painted in years… * moment of fear*) and pull a single monotype. Actually that did feel good: I suffer from the anxiety that anything I might have racked up in the way of skill or experience will have evaporated in the long gaps in between working; it hadn’t. I knew what I was doing and it wasn’t bad. I’ll look at it properly tomorrow and might try the image again. The thing is, I know that all I really need to do is to get stuck into it – I just get paralysed/sidetracked/diverted away from it – hence the brilliance of the website pointed out to me by LouLou! Part of the problem is that I’m having a bit of a panic about a big show coming up next year. On the one hand I’m plodding through the practicalities (dates, times, deadlines), and I’ve even come up with a name for it (“Speaking in Tongues”, given my current preoccupation with text and the development of language), and on the other hand I’m having heart-failure about the thought of putting together a coherent body of work that anyone will actually want to see. All there is to be done is – as ever – to move forwards, building things up as I go. And I'm so sorry your chicken hasn't returned. Ungrateful little sod! Probably shouldn't have read this before breakfast.Bugger! But I know that feeling.It's when my procrastinator beats, pummels and completely subdues my action-woman. Hang in there, Sara. I know exactly what you're going through, as will many commenters to follow. It's a very personal battle, so there's not much other advice to give you because you're doing all the right things. The only other thing I can say is BREATHE. Go outside at least once a day and sit in the sun and watch the clouds. Or whatever else is happening in the sky. Unless it's raining, in which case stay away from that damp patch in case it gives you the wobblies. Wow. I can relate to this “stuggling” feeling…and a brand new, crisp white-paged sketchbook IS intimidating. I have a beautiful, beautiful bound sketchbook I recieved a few years ago & have been afraid to draw in. I should just dive in and splotch it up.